and I love the expression on his face while he's asking..so innocent. really. Not something I'd ever do , yea right! Have a terrific toon Tuesday. With my long furs, I do this very often. BOL. MOL, so glad my floofy cats don't go outside or they'd do the same thing I'm sure! 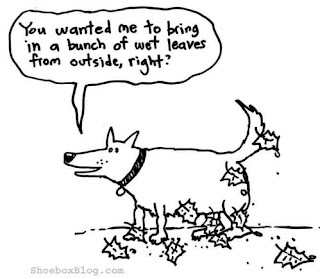 We are glad when it is only leaves stuck to our fur. Sometimes we come in with little slugs stuck to us. but that is a very funny image. I can imagine the real picture. No leaves here and that's a good thing!! Ha! Ha! Ha! That happens here in BC too! It's the wind that did it! 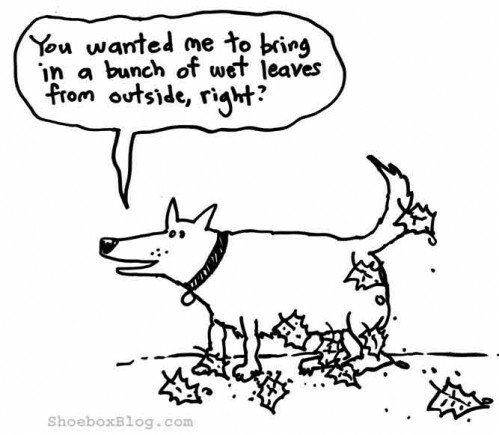 Ech, and they are probably oak leaves too! Woofies are SO silly! No self-respecting cat would EVER do such a thing. As if! oh Charlie, you TOTALLY would have! MOL!